This trip includes everything that makes Nepal a classic travel destination. Discover beautifully preserved palaces and temples in Kathmandu, see picturesque monasteries perched high in the hills, experience traditional Nepalese life and be constantly surrounded by timeless mountain views. Meet Sherpa people, see Newari wooden homes, dine on traditional food and visit the charming towns of Bhaktapur, Bandipur and Pokhara. 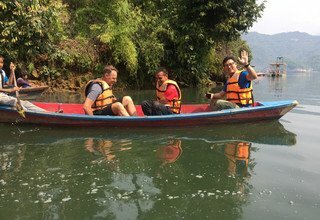 Add a teahouse trek through the Langtang region, rafting the Seti River, a wildlife safari in Chitwan National Park and the buzz of Kathmandu for a truly remarkable travel experience. 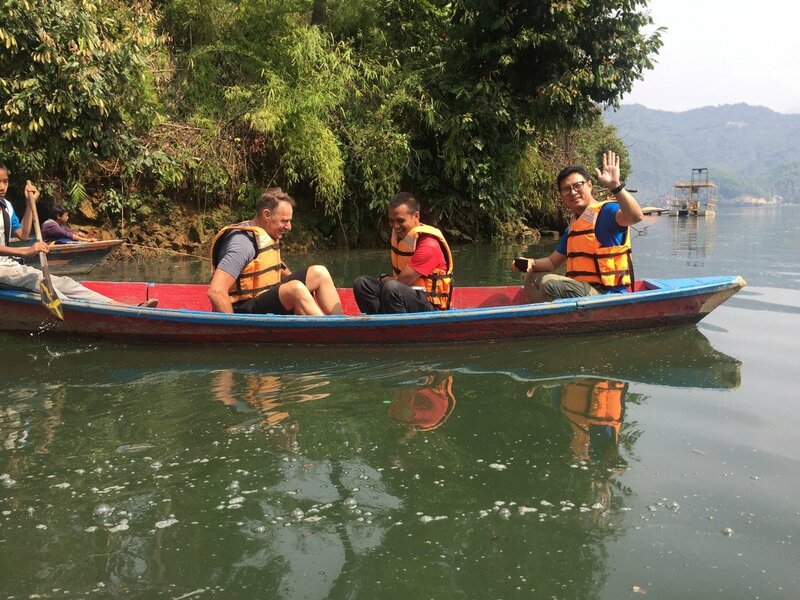 Visit Pokhara and be charmed by the air of quiet magic Travel through Chitwan National Park on a safari tour Experience Nepalese mountain life in Bandipur. Day 1 Arrive in Kathmandu’s International Airport (TIA). Meet our Airport representative and transfer to Hotel. You are received with welcome drinks in our Hotel. Our tour leader will brief about the trip. Day 2 Visiting the oldest shankhu city and stunning temple of Bajrayogini. After breakfast in the Hotel, You are going to drive for 25 kilometers far to explore the oldest city Shankhu. Shankhu is the Newari city offers you newari culture and way of life. Through the Newari settlement Shankhu we will drive in a luxurious car up to the stunning and towering pagoda temple of Bajrayogini. Day 3 Kathmandu to Nuwakot Tour. After breakfast in Hotel, you will be driven by the luxurious car to the highly sophisticated Nuwakot Farm House. After check in there, you will step further for exploring breathtaking mountain views and fascinating bazaar. Day 4 Exploring the oldest Nuwakot city and its Durbar square. It’s the day to smell, fell and see the classical nuwakot city, with 5 stories Durbar and its square with ornately decorated by the various temples. In the Nuwakot Farm house, you will have an opportunity of being with different kinds of domestic animals and to play with them. In the same day, it is possible to explore the nearby areas and to have opportunity of having conversation with the locals. On a clear weather day, we can view Ganesh himal and of course sunrise and sun set is another attraction of the area. Tonight stay in the Farm House. Day 5 Nuwakot to Bandipur 4 hours Drive. Nepal is rich for having 100s groups of ethnic people. Among them, Newari is one of them and who are considered the aboriginal of the Kathmandu Valley. Similarly, in Bandipur, we can see dominant settlement of Newars. After our arrival over here, we will be check in to the Old In Resort and similar standard which is built with the classically old ornament as the name of it. The moment you are inside the Old In, you start feeling you are inside the house built centuries back. We are going to explore some part of the old hill city for sometimes. We go to visit local stadium where we can see people playing different games and in the mean time we see the Dumre and other settlements from another corner of the stadium. Tonight in Old In. Day 6 half day explores remaining Part of Bandipur. Never forget to visit old Palace “Durbar” and its square in Bandipur which offers you to experience medieval history, culture and architecture. Rest of the time you can go for short hiking and back to Old In. Day 7 Bandipur to Pokhara. Almost in 4 hours drive, we are in Pokhara. After check in, we will go for boating on the Fewa Lake and we will visit the temple of Tal Barahi built almost in the Center of Phewa Lake, this two-storied pagoda is dedicated to the boar manifestation of Ajima, the protester deity representing the female force Shakti. Tonight in Hotel Temple Tree/ Shangri-La/Fishtail Lodge in Pokhara. 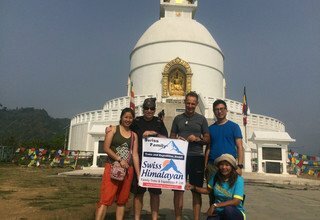 Day 8 Tour in Pokhara. Pokhara is situated 200 kilometers west of Kathmandu. It is linked by Air and by road from Kathmandu and the Indian border Sunauli. Pokhara offers magnificent views of Dhaulagiri, Fishtail, Manaslu, five peaks of Annapurna and others. This is one of the few places in the world to provide such a dramatic view in a sub-tropical setting. The nearest snow-capped mountain - Fishtail is less then 30 kilometers from Pokhara. Pokhara's numerous lakes offer fishing, boating and swimming. 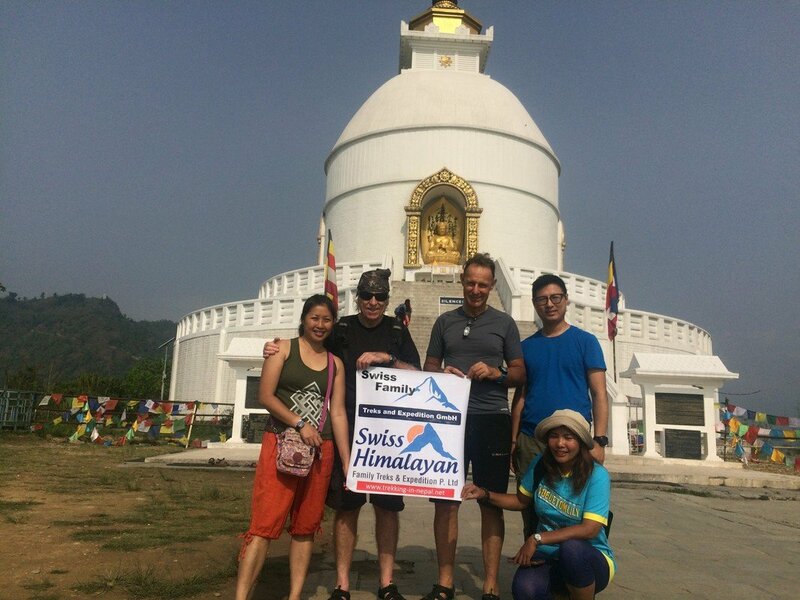 World Peace pagoda is situated on the top of a hill on the southern shore of Phewa Lake. It has four images of Buddha facing in our directions. The pagoda is an impressive sight and its hilltop location commands great view. It is a great vantage point, which offers spectacular views of the Annapurna range and Pokhara city. Devi’s fall and Gupteshwor Cave are just opposite to each other and always good to visit them Gupteshwor cave is popular for the different natural forms made from limestone deposits and we visit the most famous water fall just nearby famous with the name Devi’s fall. Bindhyabasini Temple is one of the oldest temples in Pokhara. Legend says that when Pokhara was a part of Kaski Kingdom, the main deity of the temple, Goddess Durga, was brought from India. Apart from the peace and tranquility that can be felt in this region, the premises of the temple offers a good view of the Himalaya on a clear day. The temple is in the area of the Bazaar; hence, a journey of the old bazaar can be combined with a visit to the temple. Day 9 Pokhara to Chitwan by Private car/Van/Jeep. Day 11 Chitwan to Kathmandu. Departure and back to Kathmandu in the same Hotel. Day 12 Sightseeing in Bhaktapur & Patan Durbar square. After breakfast, we are going to visit two historical monuments which represent early and late medieval history, architecture, culture and religion. Bhaktapur Durbar square is an ancient newari city, 13 kilometers far from Kathmandu stores numbers of Hindu temples, 55 windowed medieval durbar and offers you various examples of metal smith and wooden craft along with the opportunity of exploring traditional pottery work to the another corner. Patan durbar square is equally important which represents late medieval history, Culture and architecture. Tonight in the same Hotel. Our car will drop you to the international Airport in Kathmandu. * 4nights accommodation in twin bed sharing basis with breakfast at 3*** hotel in Kathmandu. * 2nights accommodation in twin bed sharing basis with breakfast in Nuwakot Farmhouse Resort and similar in Nuwakot. * 2nights accommodation in twin bed sharing basis with breakfast at Old In and similar standard in Bandipur. * 1 Experienced tour guide. * Any meals in Kathmandu ,Pokhara, Nuwakot and Bandipur other than breakfast. delays, political disturbance, and strikes etc. Tour cost per Child person: 25 % Discount on adult cost.